How to target baitballs off of Australia's East Coast..
Marlin will push bait to the surface to trap the bait and feed on it. Your best tactic in this scenario is to slow-troll upwind or upcurrent with two or three live baits and drift back over the bait. Photo by Al McGlashan. 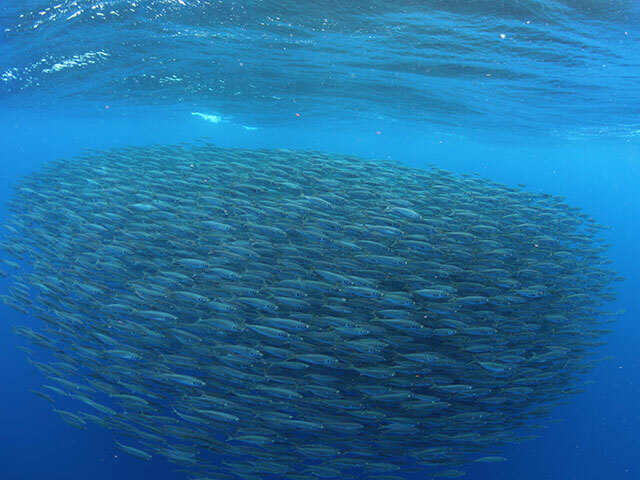 A school of bait harassed by predatory will appear red on the sounder, which indicates that the bait is tightly packed in a defensive baitball formation. The tighter the bait ball, the more trouble the bait is in. You'll also want to log your drifts to keep an eye on the current and movement of the fish. Photo by Al McGlashan. While billfish are opportunistic feeders, they definitely prefer some baitfish over others. At the top of their list are slimy mackerel. Photo by Al McGlashan. We fish three live baits on circle hooks. One bait off each outrigger and one bait set back behind the boat. Photo by Al McGlashan. When you do hook up, try to leave your other baits in the water as long as possible. This could lead to a double or even triple hookup. Photo by Al McGlashan. The key to fishing live baits around a baitball is to position the bait as close to the baitball as possible. The nervous movements of the bait will not go unnoticed. Photo by Al McGlashan. Find bait and you will find fish. It's a simple rule that applies to just about any fishery in any part of the world, and it's especially true off of the east coast of Australia. Australia’s East Coast sees an annual run of slimy mackerel (also called “blue mackerel”) that can come in epic proportions. 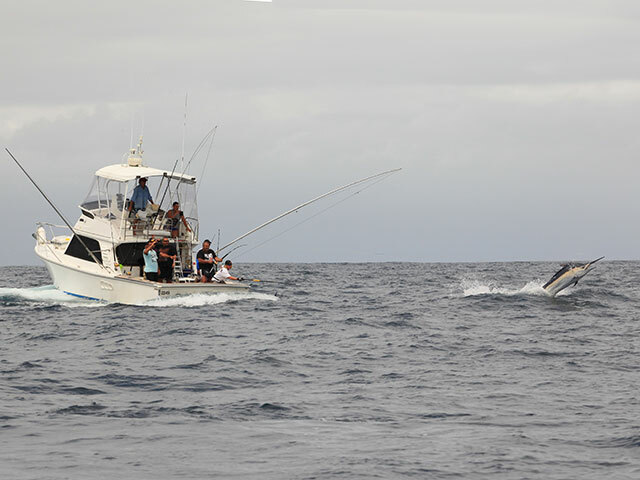 When the bait stacks up along the Gold Coast, Port Stephens, Jervis Bay and Bermagui the billfish bite will begin to fire on all cylinders. With so much food around, the predatory game fish will turn up in droves, offering anglers a good shot at a billfish grand slam. Cowanyoung (jack mackerel), red bait, yakkas and even the dreaded leatherjackets will all school up together, and while billfish are opportunistic hunters that prey on a wide range of species, not all baitfish are treated the same. Mackerel definitely rate at the top of the menu, and if you’re looking to tally the most billfish bites, you will need to learn how to spot mackerel on your sounder or fish finder to key in on the bite. Mackerel tend to sit higher in the water column than yakkas, which will often help you to distinguish between species. If all else fails you can always drop a bait jig down and see what comes up! A bait school harassed by predatory fish shows up very differently on the finder compared to bait that is happily feeding. 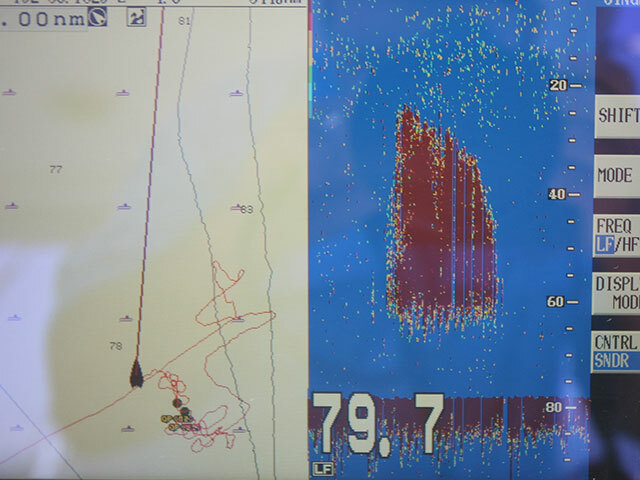 On my fish finder, a feeding school will appear green, while a red return indicates bait that is tightly packed in a defensive baitball formation. The tighter the bait ball, the more trouble the bait is in. The higher the bait sits in the water column, the more likely you will be able to pull billfish off of it. 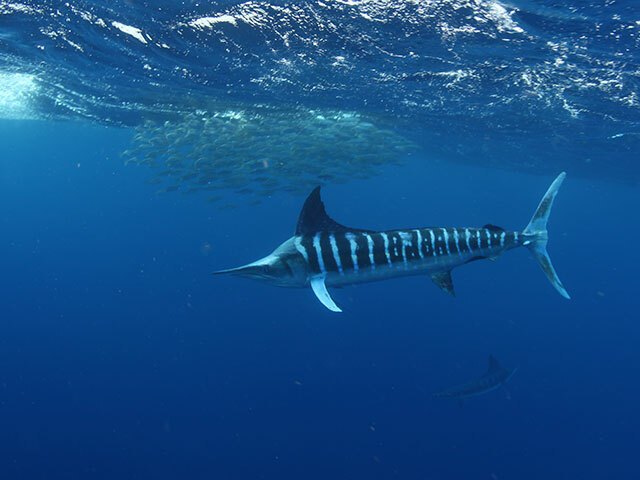 By pushing bait to the surface, predators can trap the bait, which will instinctively form a baitball, and the billfish will begin to feed on it at leisure. When this occurs, sea birds will also join in on the feast, attacking from above. The same principle applies to bait you mark down deep, hugging the bottom in 60 or more fathoms. Wherever the bait forms a vertical peak it’s a sure sign that there’s something harassing the school. When there are a lot of bait patches in an area, scout around with the sounder. The most productive patch of bait will often be higher or more active than the other schools. Often, for some inexplicable reason, predators will focus on one particular bait school among many so look around before settling in and dropping lines. Also note the tides and current because bait will commonly rise up towards the surface as the change of tide approaches. The best days to fish are those that have two daylight tide changes -- one in the morning and one in the afternoon. When working baitballs, put out multiple baits to maximize your chance of a hookup. Most crews usually run three baits -- two from the outriggers and one straight behind the boat, fished off of the rod tip. Stagger the outrigger lines to minimize the chances of tangles, as you’ll often be making tight turns to keep on top of the bait school. Deploy the third bait with a breakaway lead at the same depth that the bait is marking on the sounder. Only set this line when the boat is actively drifting over the baitball. The best approach is to slow-troll upwind or upcurrent, then drift back over the bait. If the drift is fast, keep reversing up to hold the boat over the bait for as long as possible. Once you come off the bait use your GPS to realign yourself for the next drift. 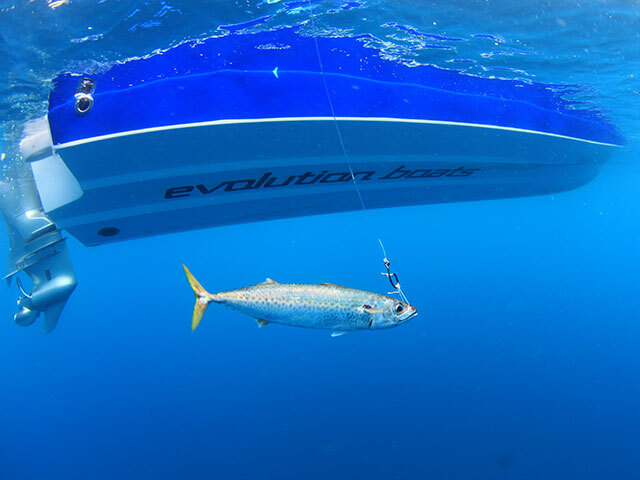 While drifting, the baits on the outriggers should naturally swim down and hold position at various depths, which means you will cover a majority of the water column. Catching billfish on a live bait isn’t particularly difficult because the bait does all of the work for you. A nervous live bait on the end of you line will send out vibrations that act like a neon sign for billfish already in a feeding mode. The key is to keep your live baits right next to the baitball and never, ever leave it. A hungry fish will eventually find your bait so make sure you are there to meet it. Go here for tips on how to rig a live bait. When you do hook up, don’t immediately pull in the other baits. 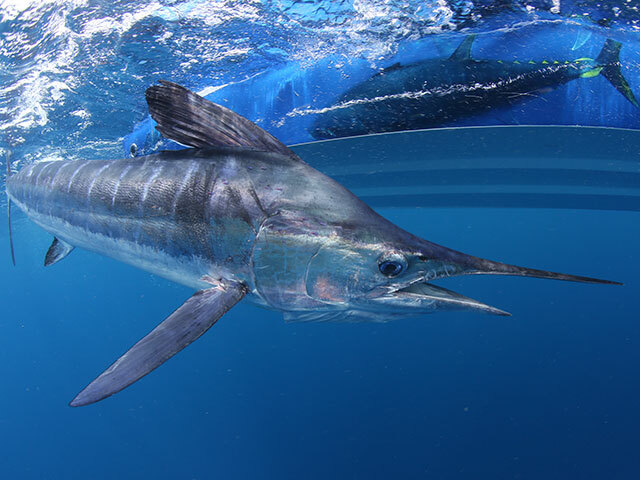 As long as you have your marlin under control, leaving your other gear in the water gives you a good chance of turning a single hook up into a double or even a triple when fishing these offshore smorgasbords.